Over the last week you've watched his video, and now it's time to join Ted in the community today, Thursday, April 6, 2017 from 11 a.m. to 12 p.m. PT, for a live Q&A event! 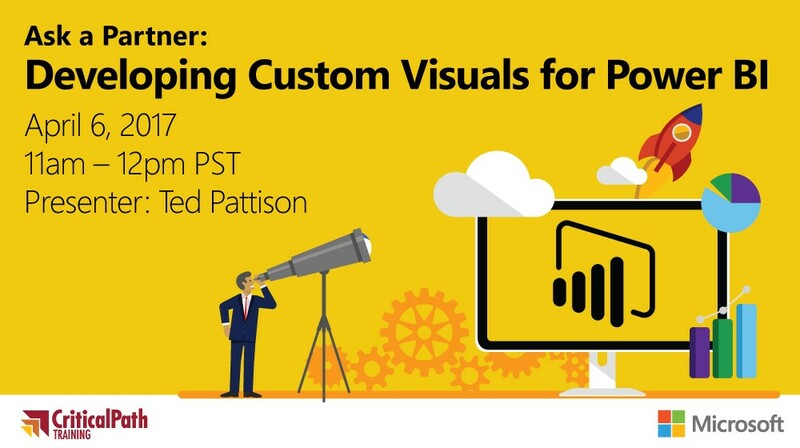 This is your opportunity to ask questions and share feedback directly with Ted and learn from his extensive history with custom visual development, Power BI, and training. Join us in the the Q&A forum at 11 a.m. PT for this live event, and don't forget to Kudo Ted’s video by end of day today for a chance to win an official Power BI t-shirt.